Before we really kick this blog into high gear, I think it’s appropriate to slow down for a second and delve into a team mom’s duties. When talking about this subject with friends and family they typically say, “It’s just snack schedules, right?” Oh, these poor unfortunately souls. They don’t understand Team Moms are the backbone of any team. Without them, the nuisances of team management would be left to the coach or manager who is already busy enough putting together practice plans, running drills and creating successful line-ups. So what DOES a team mom do? 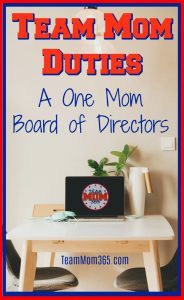 There’s an easy explanation for this: a team mom is like a one-person Board of Directors. They hold virtually every position on a typical board of directors… Relax… There is no need to hyperventilate. Let’s break this down into easily digestible clumps. Let’s start with the big one, the ‘F’ word… no, not THAT ‘F’ word. I am talking about FUNDRAISING. Whether it’s an ‘a-thon’, a car wash or a restaurant giveback night, in all likelihood you will be asked to coordinate your team’s participation. This could be as simple as just handing out paperwork if you are in a club environment all the way to completely organizing fundraisers from beginning to end. This is one of those catch-all positions on every board of directors I have ever been a part of that of. If it doesn’t fit anywhere else the Equipment Manager takes care of it. This typically encompasses everything from the actual sports equipment to uniforms, tournament gifts, coaches gift and spirit wear. Even in larger club environments, the team mom is still expected to gather information such as equipment needs, sizes, uniform colors and spirit wear orders. It’s two minutes to game time and you notice there aren’t any parents at your field or court. I can assure you, they aren’t late. They are trying to escape the coach who is looking for volunteers to do stats or ref the game. Guess what that means? It will likely fall on you as the team mom. To get you ready for these occasions consider brushing up on the rules and how to keep stats for the sport your child plays as soon as possible. I can’t even count the times I have been called on to keep stats, base ump or line judge. Sounds nice, right? Everyone working together for the greater good. We have all been a part of that *MAGICAL* team where everyone gets along… parents, players, coaches, everyone. It’s wonderful when this happens because it has a way of translating into spectacular results on the playing fields. However, that kind of synergy also takes a lot of hard work. The Team Mom’s duty in this regard is to help facilitate synergy between the Parents and Coaches, Team and League/Club and even within the parent group. Having a good head on your shoulders and the ability to stay impartial will help with any interactions which get heated. Team synergy isn’t only keeping warring factions at bay, it’s also planning fun team building activities, team parties and events. It might be a not seem important but you would be surprised how much simple activities such as a team trip to SkyZone or a game of Pie-In-The-Face before or after practice can help team synergy. The #1 thing in my “Team Mom Bag” is a first aid kit… and I am not talking about the cheap one you get at the local drug store with two Band-Aids and a couple gauze pads. The best first aid kits are homemade and include all the appropriate basics. As the team mom you will be called upon to render care for any number of boo-boos from sliding raspberries to floor burns. Having the appropriate tools and know-how to care for these injuries is a must. As a Team Mom, you will end up being just that: a mom to the whole team. Sometimes it’s as easy as just listening. (FYI, Car rides to tournaments and down games are a great time pick up on player’s frustrations and difficulties.) Sometimes, its lending a comforting ear to a player who needs a fresh perspective on a matter. An important thing to take into consideration: you are not their parent. If you remember that, you will be fine. I will impart this word to the wise: I beg of you, please know the game. Don’t get me wrong, I love when parents are enthusiastic about their kids playing but you just sound like a fool when you are yelling and don’t even understand the rules of the game…. AND it’s embarrassing to your kids. There will come a time when you just simply can’t do it all yourself. During those times you are going to have to seek volunteers. Whether it be for keeping score, joining the snack list, manning the concession stand, base umpiring, etc., you are simply going to have to have the ability to ask for help. It hurts, I know, because no one can do something as good as I can. As you can see, I am a horrible delegator but trust me, in the long run you will be happy you did it. Hello, my name is Sue and I will be your flight attendant today. Whether it’s hotel reservations or simply getting the players and their families from Point ‘A’ to Point ‘B’ at the right time, you are going to have to become well versed with using Google Maps, finding play locations, researching dining options and booking tournament accommodations. In some situation you may also be called upon to book rental cars or flights depending on how your team prefers to travel and how far they go. Financial management is a huge part of a team mom’s job duties. There is the potential of thousands of dollars running through a travel team’s coffers so you want to have a solid method for maintaining the finances. Whether it’s an established program such as Quick Books or something you put together in Excel, having an easily manageable program is a must. It also creates transparency which in this day and age is an absolute must. Communication, Communication, Communication! That is the key to any team mom’s success. Whether it’s via phone, email, text message, group messaging app or carrier pigeon, if you can communicate all the information above, and sometimes with delicacy, you will have a great season. Another aspect of communication, depending on the environment in which your team participates, could be social media. In this era of recruiting, a lot of colleges look to social media to find prospects and follow them. Your social media acumen could be just the thing that gets a player recognized as the needle in a haystack a college is looking for. Be prepared to be a stand in for the coach if they are unavailable. This includes things as simple as answering questions all the way to getting practices started. I even had to coach a volleyball game one time when the coach got sick. Talk about being a fish out of water. Sorry to be the barer of bad news but this is one position you do not hold. That honor belongs to the coach and/or team owner. Their job is to guide the team’s athletic progression and coordinating everything that happens “between the lines”. If you understand this from the very beginning, it will make life so much easier. Just think, with all the stuff we talked about above, at least you don’t have to come up with practice plans, drills, plays, etc. So do you think this job is for you? Let us know if we missed something. You are so right. The most rewarding experience of my life has been watching these kids grow and mature into confident young adults through their participation in sports. Aren’t they, though!! 😉 It’s been my favorite ‘job’ my whole life. Wow! Team Mom is quite the job! 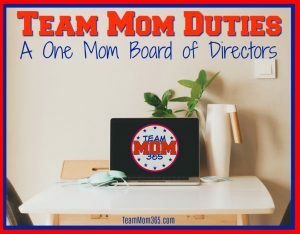 « Welcome to Team Mom 365!